Happy Labor Day Weekend, everyone! Life as a family of four now has us currently adjusting and just settling in so excuse the lack of posts but I promise there's a lot coming up and while I'm trying to tell myself to take a break, it's just not happening. Hahaha. Anywho, there's just something about a great-smelling house that makes everything feel put together, am I right? It makes me happier and, dare I say, even more productive throughout the day! Whether it's the scent of your favorite flower, a scent that brings you back to a great memory or just a scent that's covering up a different less-than-savory scent (like when a certain toddler decided to throw his lunch on the floor and mush it into the carpet and no matter how many times you've cleaned it, it still smells like hot dogs in the living room), a great scented candle can make everything come together in the end. But as a parent, having open candles around (no matter how high up away from the kids) isn't ideal - because toddlers - and have you guys even see the crap they put in candles? No bueno! I had no idea how many chemicals were even in your typical candle. So disappointing! Until I heard about Candle-Lite's new Scent Bursts and Scent Sticks (found at your local Rite Aid)! They're mess-free, clean, all-natural and won't break the bank! 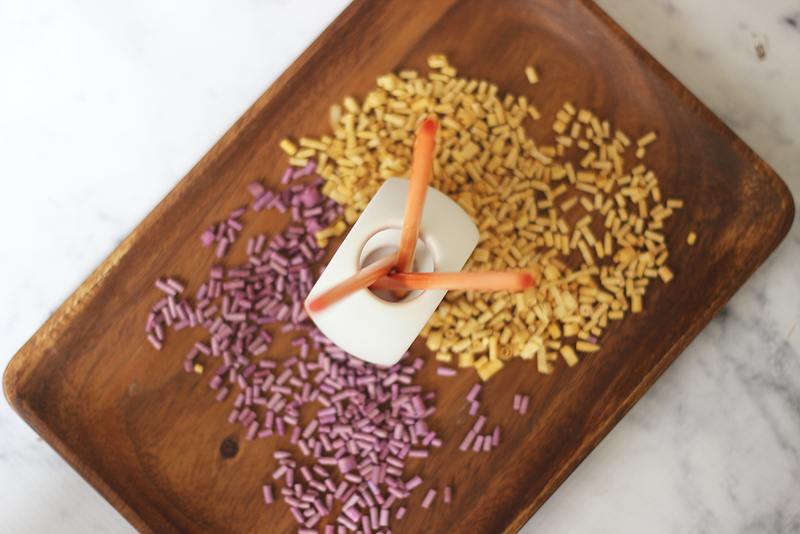 Scent Bursts - The Scent Bursts can be used with any electric wax warmer - but the catch is: these aren't wax! Aww, yeah! They're made from sustainable paper and pure, natural fragrance oils so they never, ever melt to make a mess. That means easy clean up and you can switch up scents whenever you want. The Scent Bursts last two times longer than your average wax melts AND the scent is immediately released upon being warmed. Pretty sweet, right? 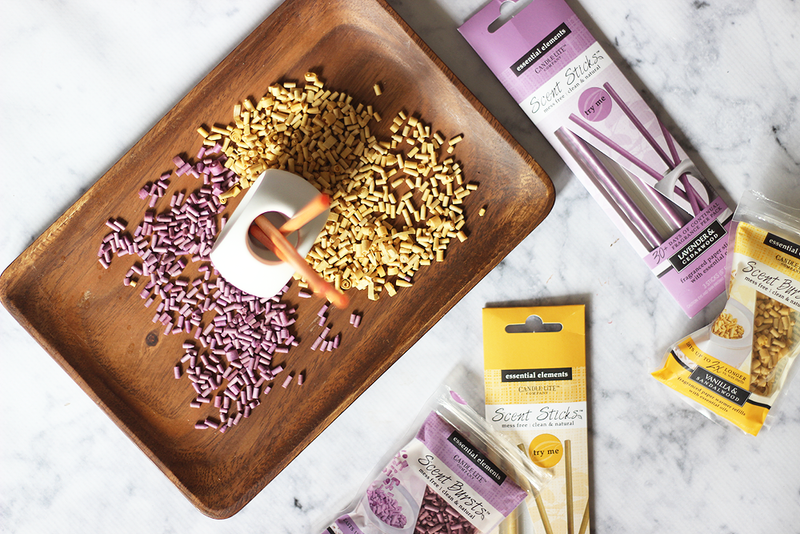 Scent Sticks - If you don't own an electric wax warmer, these are perfect for you! The Scent Sticks have absolutely no liquid = no spills! They, too, are made from sustainable paper with essential oils and pure fragrance. You can pop them into any holder and set them up on the table for a fragrance that lasts for over a month! These were totally made for me as I love anything that you can set and forget until you want to change the scent. Speaking of scents, Candle-Lite currently offers 12 different fragrances from their Essential Elements line including four new scents: Jasmine & Patchouli, Oakmoss & Bergamot, Nutmeg & Outwood and Blood Orange & Teakwood! I've been loving the Lavender and Cedarwood (a mix of floral and woody fragrance), Blood Orange and Teakwood (a little fruity with lemon and orange) and Vanilla and Sandalwood (kind of an earthy scent). I love that they have a great variety of fragrances and have a little somethin' for everyone. Whether you're looking for a more masculine scent (Aloe & Agave!) or fruity (Ginger & Citrus), they've got you covered! What's your favorite scent? Do you use wax warmers? Shop | Find these at your local Rite Aid!